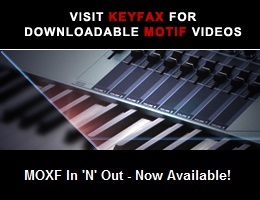 Viewing topic "Has Motif XF “Super Articulation 2"(Tyros3) sounds…or a few even better (Tyros4) ?" Does it have S.A.2 sounds ( similar to Tyros 3 or CVP500 piano series)? No, it does not. The sound engines for the Tyros and Clavinova are very different. They are targeted to hobbyist uses so they have many automated features like SA2 which automatically play articulations. Some of the functionality of these types of voices are available as XSpanded articulation features, but the end user has more control over when they happen (you press the AF1 or AF2 buttons to get the different articulations). The other difference is that you do not have the depth of user programming on these Clavinova based sound engines that you ahve on the Motif because of the different sound architecture. Like the upgrade from Motif XS to Motif XF, I wonder what the upgrade from the amazing Tyros3 to Tyros4 will be like!...;)...! If it wasn’t for the high cost of the excellent Tyros models, there are many times that I wish I had purchased a Tyros instead of my Motifs! On TYROS forums the madness about an eventually introduction in Oct 2010 of a TYROS4 is started. What will it be, What will it offer. As an MOTIF XS8 and TYROS 3 owner I hope the TYROS 4 whenever it comes will be a revolutionair different machine, hopefully more to the direction of the MOTIF series and FW support. Nevertheless, if you want the benefits of both different synth’s. BUY BOTH. BTW, I protest against the way Yamaha US characterises the TYROS3 as a machine targeted for hobbyists. That is simply not true. The articulation of the SA2 voices on the TYROS3 are fully controllable by the way you hit the keyboard. No need for hitting AF1 or AF2 knobs. Just your play style influences the articulation effects on the SA2 voice. Meaning the keyboard of the TYROS3 is more advanced than the ones on the XS6 and XS7. The XS8 is a different story because of the weighted keys. “Hobbyist uses”!, what a joke Yamaha US!! I am shure it must be a joke!!! Thanks for the moral support in this. T3 targeted to hobbyists. NONSENS. 99 percent of the songs I have listen to on the mo song forum played by MOTIF users, I cannot characterise as played by professionals. I really do not hope Yamaha is dependent from the real pro players for the sales of there MOTIF range keyboards. Yamaha will be out of business quickly. LOL. OK. One thing is wondering me, why did Yamaha not use the wonderful audio engine of the TYROS3 for the MOTIF XF, the technic is available, the knowledge is available. A missed chance I think. Yamaha could throw EVEYTHING into one box, and jack the price way up, but NOT everyone can afford that price, so split up EVERYTHING, and offer parts to each machine, and only release certin parts at a time, thus giving the appearance of new creations, and thus upping the sales of each machine. The XF and TYROS 4 could be ONE WORKSTATION, but not a smart move. Split it up, a little here, a little there. Think, how many people own that expensive Korg O thingy, compaired to owners of the T2 and XS? You might be right. It is just a way of making easy money. I mean, using this T3 engine they had the possibility to create a seperate voice bank for only SA2 TYROS3 voices in the XF. Not editable (to complex maybe) but available only to play. I don’t think it’s dictated by marketing. If Tyros4 will be based on Linux platform just like the XS/XF, then Tyros5 and next Yamaha workstation could in fact introduce some cross-compabitle design elements. As of now, they use completely different OS made by different engineeres for very specific needs, so re-use of technology is impossible. A good parallel would be Windows 3.0/3.1/95/98/ME line and Windows NT3/NT4/2000/XP/Vista/7 - these are two completely different architectures internally, even though they can run the same applications and data, so no-one in their sane mind would consider merging them - it’s far more practical just to concentrate the efforts on a better architecture and re-implement the best parts of the user interface from both (hence Windows XP, which is technically a successor on NT/2000 line, but from the user POV, it’s rather a continuation of 95/98/ME line). Yes, this is the first time Yamaha has not put all the sounds of Tyros into Motif. BTW I agree with Yamaha_US that tyros is targeted to hobbyist uses and has different sound architecture. For instance, a piano sound of the Motif is more detailed and clear than of Tyros. I don’t own a Tyros, but that statement about the target of the Tyros series, is a bit iffy at best, because lots of professional use it for their line of work. DmitryKo, Sir I understand your statement. Not the first time. Tyros 2 had lots of Brass/Trumpet/Sax/Strings articulations that were not included in the XS. Have you ever seen Tyros on stage? I bet not. Why? Because T is only used by hobbyists. Tyros and Motif are two different products for different users and, please, let’s keep it that way. I don’t want a synth that sounds like my daughters PSR. Wha? Many of T2/3 acoustic sounds are much better than those in XS. It is clear that you do not know a thing about the TYROS3. I have seen this synth present in several big broadcast orchestra’s in the Netherlands and Europe. Maybe in the USA they still have to discover this machine. I have to admit that in dance and rap groups you see more MOTIF like machines, but thats logical. You do not need great voice quality in such bands. LOL. It is all boom, boom, boom, boom boom boom. Jungle sounds.